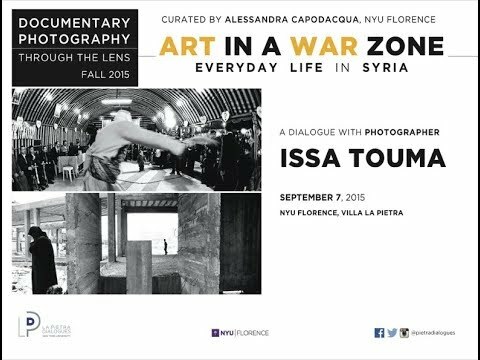 Award-winning Syrian photographer Issa Touma, the founder of the Le Pont Organization in Aleppo and organizer of Syria´s first international photography show, will present a poignant visual diary that sheds light on everyday life in Syria, and his experience of the country´s continuing civil war. Despite opportunities to escape the violence and instability in Syria today, Touma has mostly remained in his native city Aleppo to document the daily lives of the city’s inhabitants amid the difficulties of war and to help promote art, creativity and peace as a counterbalance to the violence around him. Touma’s Le Pont Gallery has remained open and the program he launched Art Camping has organized art workshops in the community. Touma will talk about the importance of art as a form of resistance and hope in the face of war. Touma commitment to bringing world photography to Syria shows in the number of festivals he hosted and organized since 1997. He also organized the 8th Women’s Art Festival, which had more then 70,000 visitors. In 2006 Touma served as artistic consultant for the exhibition Images of Syria, at Moestings Hus, Copenhagen, which included photographs from his series Aleppo from Above together with other Syrian & Danish Photographers. He also served as juror in the Backlight Photo Festival in Finland in 2014. September 8, 12:30 - 2p.m.